Have you ever wondered what size steel pipe would be best for your fence posts and stays? Here we answer all your steel pipe sizing questions! What Size Steel Pipe Do You Need For Your Fence Posts & Stays? The ideal steel pipe size for your fence posts and stays will vary depending on your specific needs, but we recommend steel strainer posts of 80NB (89mm O.D) or larger so that the post will be strong enough to support the fence. All of our end assemblies use 80NB or 100NB posts with 40NB or 50NB stays. 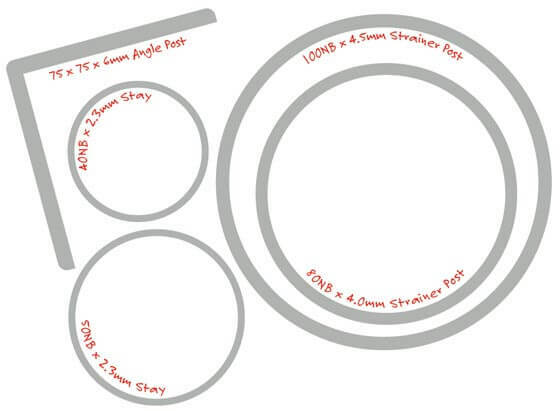 The table below shows the most common steel pipe sizes with their outside diameter (OD), nominal bore (NB) and wall thickness to help you better understand the differences in steel pipe sizing. What Is A Nominal Bore? The nominal bore is the hollow section of the pipe. Nominal refers to the approximate measurement of the bore. Pipe was originally measured in inches. 100NB pipe works out to be exactly 4.5 inches (4.5(inches) x 25.4(mm/inch) = 114.3mm). That is why the outside diameter can’t be simple number like 100mm. There are regulations that govern the outside diameter (O.D) of pipe. So, to allow for different wall thicknesses in the manufacturing of pipe there had to be variable. That was the inside diameter (I.D) of the pipe. Be Careful of 90NB Pipe! 90NB posts aren't common in Australia. However, sometimes a store will ship it from overseas and sell them at a cheap price. The problem is the 90NB outside diameter (O.D) is 100mm. As a result, it often gets confused with a 100NB post, which has an outside diameter of 114mm. A common issue is a customer will go into a shop and ask for a 100mm post, thinking they are requesting the common 100NB post. However, they get a rude shock when they get the 90NB post, which is technically 100mm in diameter. The problem arises when you try to get an end assembly or clamp for a 90NB post and none fit! It can be difficult to find good clamps for 90NB fence posts in Australia. So how can you check what pipes you have? Refer to our pipe sizing chart above. What Are the Section Colours For? You have have noticed that we have coloured the different section types. There is a reason for this. The Section type is the wall thickness as steel merchants would refer to it. All pipes have colour painted to the end of it. If you see green on the end of a piece of pipe, that means it is "extra light" regardless of the size. If it is yellow, it is "light", blue is "medium" and red means it is "heavy".